Dr. Hongwei Xin, Environmental Liaison for the UEP Certified Scientific Advisory Committee, has been selected by peers to receive the 2018 Cyrus Hall McCormick-Jerome Increase Case Gold Medal Award. Established in 1932, this award recognizes “Exceptional and Meritorious Engineering Achievement in Agriculture” and is sponsored by CNH Global. The award will be presented during the 2018 American Society for Agricultural and Biological Engineers (ASABE) Annual International Meeting in Detroit, Michigan on August 1. 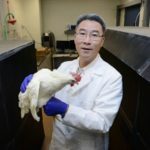 Dr. Xin is a Distinguished Professor in the Department of Agricultural and Biosystems Engineering at Iowa State University. He is also the Director of the Egg Industry Center, the Assistant Dean for Research in the College of Agricultural and Life Sciences, and the Interim Director of the Iowa Nutrient Research Center.